Jac and Stacy Westfall…one year later. One year ago today I met Jac. March 8, 2013. I wrote a blog titled, “Roxy’s Last Foal…Jac” where I discussed Roxy’s death and how Jac was born. “No one was with me when I went into the barn. When I looked into the stall and was thankful he wasn’t her color. No one was there when my heart broke for the little horse that I refused to consider…because of my pain. One year and over 100 hours of riding later, I am thankful for the pain, the journey, the video’s, the comments, the support, the criticism, the encouragement and ultimately the understanding I have gained from all of it. Here is a link to the pilot video. Below is the first day I worked Jac, March 9th, the day after he arrived. You can see the date displayed in the video as I lead him out of the stall for the first time…ever…..And below that a video of Jac’s first ride in Roxy’s saddle; Coincidence or God-incidence? ← How is Jac doing with the move to Texas? You are one in a million. As I work through the tears to send you this message, I feel your pain, excitement and love for horses. Thank you so much for sharing your story of Jac. You are an amazing teacher and the world loves you! Stay strong and please continue your teaching through these videos. I’m soon to be 54, and desperately longed for a horse since I was 3 years old. I had extreme allergies and we didn’t have the meds back in the 60’s, so I wasn’t allowed to be near them. Well, my kids have grown and left my home, and I was offered a chance to save a retired TB from the local racetrack, and I jumped at the chance!! Achilles didn’t trust me at first and he’s 17 hands of pure power, so instead of trying to jump on his back, I’ve spent the last 6 months of just loving him, and working on his ground work, and teaching him small tricks. I’ve just recently purchased a used saddle and have been on his back twice, with someone walking him. He behaved like a gentleman, so I know one day I will ride him with confidence. I happened upon your video of riding Roxy with no bridle, which led me here. Thank you so very much for your very informative videos, I’m now into your Jac series, and it’s teaching me SOO much! God Blessed Roxy’s soul, and now he is blessing you with Jac, and he is blessing us horse lovers…with you. Thanks Stacy! Stacy i bought your dvd training videos probably 4 or 5 years ago and watched all of them more than once. Now i am following your videos of Jac. I watched todays first year. I feel truly blessed that you are sharing this training trip with us. I am learning lots and enjoy it immensely. Thank-you! I agree with Ron you do great work with both; if i’m having a bad day -I watch one of your videos or read your blogs & it makes my day brighter . Thank you & so glad you are celebrating this anniversary ! You do great work with humans and horses or vise versa! Thank you for all your bloggs and video’s they are just plain good. The love we have for our animals and the love we get in return is sometimes TOO hard when we say goodbye. I often wonder, should I get another, but the answer is always YES. How could I go thru life without a dog or horse or some pet. I can’t. Saying goodbye is sooo much harder than it should be but saying Hello is what eases our pain. Can’t believe it’s been a whole year….I still am reduced to tears when you rode Roxy right after you lost your dad…I will never get tired of watching that video. Love your training sessions with Jac. Have learned so much about our wonderful horses. Some of my most precious memories are hiking the Carson River up north and watching the wild horses. They each had different personalities and were so entertaining to observe. The animal kingdom is an awesome one and we, as humans, need to realize how important all animals are and to treat them with great respect and admiration and caring. Deb Graham, is it really too late? I strayed from horses also, letting life get in the way of something I truly loved. I got back into horses last August, adopted a TB mare and am taking riding lessons! I am 56, and it’s not easy, but I am determined to not let life get in the way again. Someone told me recently that we should get rid of the things in our lives that really don’t matter to us and focus on the things that do. Stacy, all of your advice (life and horse) has been a tremendous help to me in my journey with my sometimes challenging mare. I found you through the video where you are riding Roxy with no bridle or saddle. I’ve watched it over and over and cry every time. You, Roxy and Jac are touching a lot of people. Thank you. Renee and Deb … As a kid I spent a lot of time with my friend and her horses. Lots of time, her parent’s may have claimed me as a deduction on their taxes! LOL Then life changed and I did not have horses in my life for the next 30 years. I am having my 56th birthday this April. 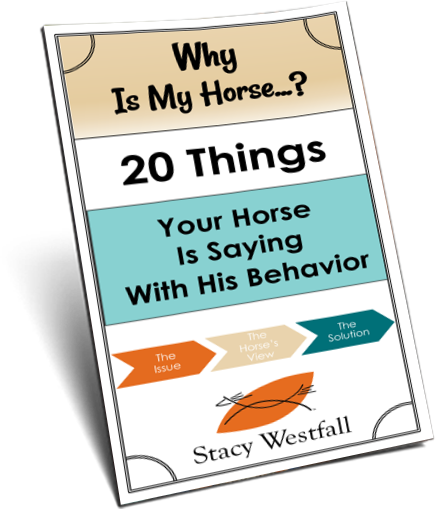 I started back with horses at 53 taking riding lessons at a local stables. 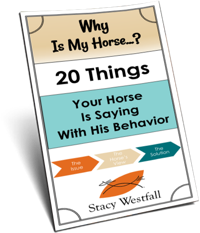 Today I am very involved with horses; one in particular at the stables and I have learned so much about ground work (which I love), how to have a conversation with a horse (great concept) and I move slowly with the horse I am leasing. I am patient and I have built the confidence I needed and I continue to educate myself (thank you Stacy) on my horsemanship. Age does not matter, you might have to do things differently and be creative. But there is so much to gain for both you and your horse. Stacy … I did not intend to hijack your story and special day. I want to say congratulations on your gift of Jac and thank you for sharing your talents and passion with all of us. Some of us you know and some of us are unknown. I am a stranger to you but you are a vital part of my horse life and feel like I almost know you. My horse life may have ended if not for your generosity and passions to share your talents and knowledge with all of us. Thank you and enjoy your time with Jac. Jackie-thank you for sharing. It is humbling to think where things can spread…so glad it has helped. I can’t believe it’s been a year, Stacy.. I cry as I read your blog…. and then I went back and read the original post of Roxy’s last foal. I love your quote about feeling the pain is part of the healing. Thank you for letting us into your soul, and living vicariously through your blogs and videos. You are an amazing woman… that I truly admire… If I would have followed my heart, my life would have looked a lot like yours…but I strayed and don’t have horses in my life, which to me is very very sad. Happy Anni-Horse-versary…..I remember reading that Roxy had other foals but didn’t raise them…..were any of her other babies her color??? No blacks. A bay and three Jac’s color.